To say we were impressed with the RG50TC is a big understatement. With regard to its price, this is a well-made, great sounding amp that suits a wide range of styles, especially favouring Brit-influenced classic rock and blues. Build quality. Portability. Wide range of 'Plexi'-inspired tones. Attractive price. The brushed dark chrome finish is a good look. The included four-button footswitch toggles the reverb, channel and boost functions. The board holding the valve bases sits in a sub-chassis. You'll struggle to find something this well built for this price. The Randall name is synonymous with solid-state amps delivering bone-crunching metal mayhem for bands like Anthrax and Disturbed, not to mention the late Dimebag Darrell with his signature Warhead X2. Randall previously dabbled with all-valve designs back in the eighties, but in 2002 it decided to jump back head-first into the valve market with the introduction of the flagship MTS modular preamp range, designed by amp guru Bruce Egnater. Following on from that success, the RG50TC is Randall's first all-valve amp to be made in China - a country that's become the first choice for many volume production amp manufacturers. The RG50TC is a proper two-channel combo powered by a pair of Electro-Harmonix EL34s driving a single 12-inch Celestion loudspeaker. The plywood cabinet is stout and neatly finished. We like the way the black steel grille on the rear is rebated into the lower baffle, damped with felt to stop it rattling. The front control panel looks the part too, with a cool brushed dark chrome finish and black lettering. The combo's steel chassis contains three main circuit boards and a number of smaller ones. The board holding the valve bases sits in a central sub-chassis and is through-plated to improve reliability, while the other PCBs are single-sided and support front and rear controls. Considering this amp's price tag, the build quality and parts standard is very good indeed: all the internal wiring is neatly bundled together and tied back and the general impression is that it's built to last. Those with doubts regarding China's manufacturing expertise in this area will be forced to rethink their opinion. Both of the Randall's two channels have independent three-band EQ controls. 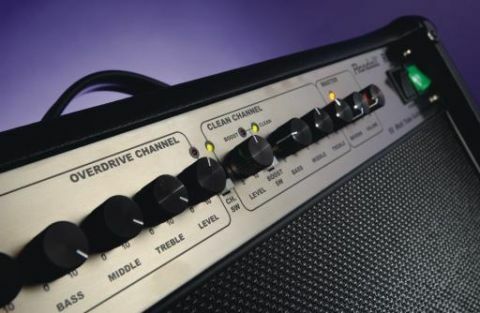 The clean channel incorporates a gain level control with a switchable boost feature, while the lead channel has two alternate gain stages offering different overdrive levels, each with its own gain knob. There are separate high and low sensitivity input jacks, an overall master volume and a reverb level control. All the channel and boost functions are switchable from the front panel, with different coloured LEDs to show you the amp's status at a glance. On the rear panel, you'll find the six-pin DIN socket for the RG50TC's footswitch, which has a generous length of cable. It duplicates all the front panel switches and also toggles the reverb on or off. There's a series effects loop with switchable levels to suit stompboxes and semi-pro rack mount devices, as well as extension speaker jacks that override the amp's internal driver. A small two-spring reverb tank sits in the bottom of the cabinet, underneath the Celestion Seventy 80 loudspeaker. The RG50's overall finish exudes a tough, no-nonsense attitude and the attention to detail inspires confidence: this is an amp that's meant to be played. Despite American design and Chinese manufacture, the RG50TC sounds very close to home - imagine a slightly (but only slightly) more civilised JCM800 vibe and you'll get the general picture. One input jack is for low output single-coil pickups, the other for higher output humbuckers. Most guitarists confronted by a dual input amp like this always plug into the high sensitivity jack, but the Randall delivers its best tones when you use the one that's most appropriate to your guitar. We tried an old Strat in the high input and a PRS McCarty in the low input and were impressed with the Randall's well-judged gain range on both channels. The clean channel is bright and zingy, but without the kind of treble response that loosens fillings in your teeth. Using the level control, you can push this into a very cool chiming overdrive - ideal for big strummed chords. It's a great pop rhythm sound, with no loss of clarity and an excellent response; punchy and dynamic but not to the point where it feels out of control. Engage the clean channel's boost switch and you're rewarded with an equally impressive crunch sound. Varying the overdrive with the level control to dial in the right balance between aggression and clarity is very easy with either of our test guitars, while the single Celestion loudspeaker manages to deliver a decent amount of low-end response. The overdrive channel is great fun and the two gain stages offer different amounts of overdrive, covering a very wide range in the process. That fashionable scooped effect isn't as precisely defined as it is on Randall's solid-state amps, but you can come pretty close with the mid control at zero and bass and treble set to around eight or nine. What's more impressive though, is how easily gain one creates some very authentic 'Plexi'-inspired classic rock sounds, while gain two delivers modern, ultra-high gain stuff that works equally well for melodic ballad solos or shredding. Think Angus Young, Paul Kossoff, Jimmy Page or Mick Ronson through to EVH or Gary Moore - pulling these sounds from the RG50TC was almost too easy. Special effects like pinched harmonics and string feedback are easily obtained too, especially using the more saturated gain two option. Most amps have a so-called 'sweet spot', where all the best sounds live. On this Randall it's very wide; getting that 'cranked up' tone even at modest volumes. It's also very, very loud. While a single loudspeaker isn't going to deliver the same sound pressure levels as a 4 x 12, there's still plenty of dynamic punch to get your point across to the audience. The key to good results from offshore manufacturing is to get the design and quality control right, and in those two areas Randall has obviously done a lot of hard work. With features to cover most players' needs, and sound quality that sits happily alongside amps that cost over twice as much, the RG50TC makes most of its immediate competition look overpriced and - dare we say it - pretty uncomfortable. From beginners looking for their first real all-valve amp, to serious players after a reliable workhorse with the range to go from pop to blues or classic rock to all-out shred, Randall's RG50TC can't be beaten. At this price, there's almost nothing that comes close.